Yesterday, we reported on the latest threat from the cyber-terrorists who hacked Sony. 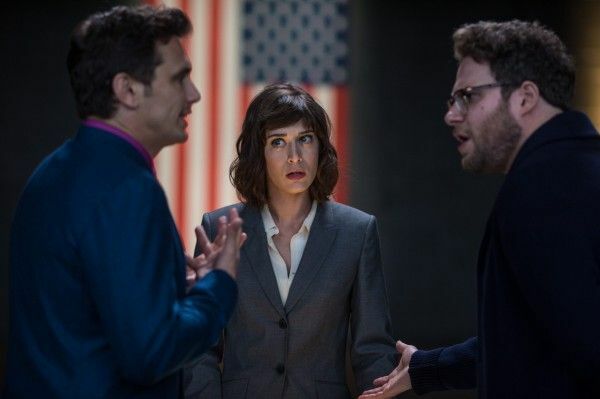 The group threatened violence towards any theater showing The Interview, and although the Department of Homeland Security says there is no active plot against movie theaters, Carmike Cinemas has decided to drop the upcoming comedy about a dimwitted talk show host and his producer going to North Korea to assassinate Kim Jong-un. Insiders tell THR that exhibitors are worried about being held liable if they show the movie and violence occurs. I assume concern about the lives of innocent people is a close second. THR reports that theater owners are bickering over whether or not to show the film, and if they show the film, they want Sony to provide “heavy security”. For their part, Sony is leaving the decision in theaters’ hands about whether or not to show the film. The studio says it will support the decision of theater owners either way. But I’m curious if Sony was supportive of Landmark’s decision to cancel the New York premiere. Sony said it wasn’t going to cancel the premiere on principle, but Landmark’s Sunshine Cinema made the call according to THR. This follows on the heels of Seth Rogen and James Franco canceling promotional appearances for Tuesday and Wednesday. On the one hand, I understand everyone’s concern for personal safety, especially after the Aurora shooting in 2012. There are crazy people out there who are willing to do horrible things. However, does this reaction now become standard policy? It’s not like this is the only hacker group in the world. Sure, there may be a bit more “credibility” to this threat because the film in question involves a dangerous country, but what’s to stop this pattern of behavior in the future? Studios are certainly beefing up their cyber-security in the wake of the Sony hack, but there’s no way to completely stop hackers. And when they do break in, steal documents, and leave threatening messages, will they continue to get their way? Update regarding the news of the major theater chains pulling The Interview: Don’t think that this is solely act of altruism or safety. I wouldn’t be surprised if part of the reason for yanking the film is that so moviegoers who plan to see other movies won’t be scared away.